You can, but don't need to pm me with your codes. I visit ppsspp forums at least once a day, and will update this post with new stuff. To find a game code press CTRL+F and type the name of the game in the search field. If you can't find the game then there's no hack for it right now. VIRGIN KLM's discussion thread is the place where you post anything regarding this post. So don't reply here. i don't know how you should do it, but i can explain you how i do it. Video + faq will be below the list, at very bottom of this post. If anyone wonder. I requested rights to edit GamerzHell9137's post to add new/missing stuff, but instead i was proposed with just making new thread by my self. So well here it is. "b" next to a game region stands for "BETA". The hack works with minor issues. "(P)" next to a game region stands for "PROBLEM" This game have at least 1 serious problem cause of 60fps - explanations to each game will be below game list. Links to coeds i ZeroX4 updated/added lead to posts, and not to pastebin site. 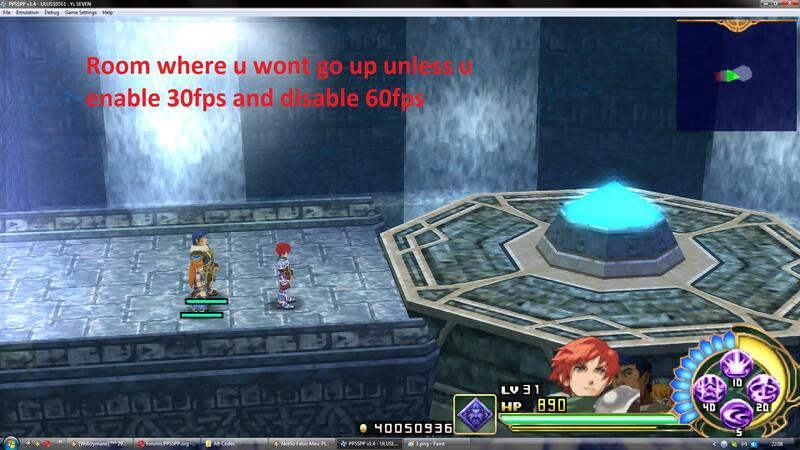 Ys Seven - IF 60fps cheat is enabled. In Abandoned Town of Edona. 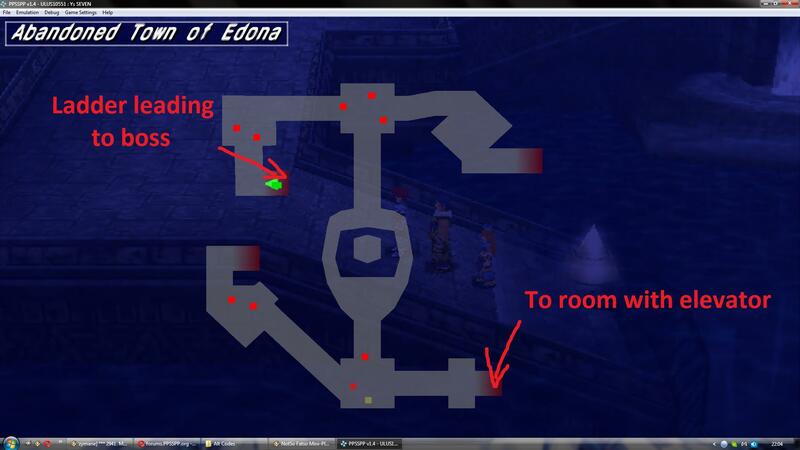 In room just before main boss Demonic Octopus Avari El you go to the ladder which is west from stone monument, and on this map you take south-east exit which leads to elevator room. You will encounter serious problem, which will make your party jump off elevator before it finish moving. 8. Text file will open. (IF FILE CONTAINS ANY CHEATS ALREADY > press enter then press up), now either press CTRL+V or right click and paste. Now save that file with CTRL+S or File>Save. 9. Close text file and in ppsspp click cheats again and select FPS cheat u desire. What if i was on mobile ? Do you have One for Naruto ultimate ninja impact??? Way of the Samurai? please. it's working 60FPS on PS2/PCSX2 , but hang and freeze for me. On PSP only 30fps. i think 60fps cheat for WOS it's not hard. Ohhh~ it seems someone has already done all of the job of updating. I guess there's no reason for me to keep updating mine. Good job Zero! (05-31-2017 12:09 AM)GamerzHell9137 Wrote: Ohhh~ it seems someone has already done all of the job of updating. I guess there's no reason for me to keep updating mine. Good job Zero! I think you should put the Rengoku 2 patch to the "b" status because I got double animation speeds on almost everything in the game. (08-25-2017 12:47 PM)Gravionne Wrote: I think you should put the Rengoku 2 patch to the "b" status because I got double animation speeds on almost everything in the game. And for juiced eliminator anybody know cheat code for at least 30 fps? Game lock on 20 and its a pity. Hey guys, I can't get the Dissidia 012 cheat to work? It only shows Force 20 or 30 FPS, but not the Force 60 FPS option in the cheats page. Can anyone help me out? Tenchu Time of the Assasins ULES00277,please some one can give me UNLOCK CW Cheat 30-60 FPS please created or sent me please? Anyone know of a 60fps patch for Monster Hunter Freedom Unite? I find it very odd that there's one for the Japanese version but not the English one. 60fps in Ratchet & Clank: Size Matters would also be greatly appreciated.